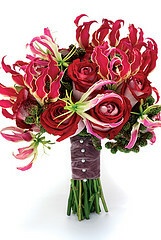 Bridal bouquet design is an important part of your wedding ceremony and your entire wedding day. Choosing the right bouquets for you and your bridesmaids can make a big difference. Listed below are several ideas and tips for you big day. A good place to start is to hire an experienced florist. A florist will be able to give you ideas and honest feedback on your thoughts about bouquets and all of your wedding flowers. A wedding planner can also be a very valuable resource to help with ideas and bringing it all together. 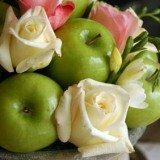 While there are many different varieties of bridal bouquets, listed below are three bridal bouquet designs commonly seen at weddings. Round bouquets are a very popular choice. The can consist of a single type of flower, but most frequently they contain at least two or three different complimentary flowers. Examples of round bridal bouquets include posy, nosegay, biedermeier and composite. Cascade bouquets are flowing with some greenery and longer stemmed flowers at the bottom. 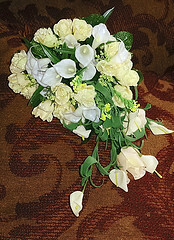 Examples of cascading bouquets include waterfall and teardrop. Hand tied bouquets offer a natural look with exposed stems tied and used as the handle. 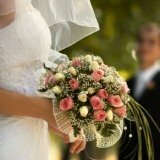 When choosing the bridal bouquet design that is right for your wedding, you will want to follow a few common guidelines. Again, a good florist will be a huge help in this area. Things you want to take into consideration are your wedding theme, wedding colors, dress style and budget. The season that you are getting married will also help narrow down the options. 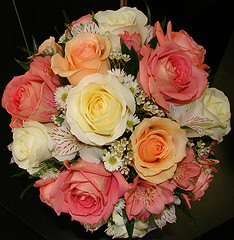 There are many different types and colors of flowers available for your bouquets. To help you stay within your budget, you will want to choose flowers that are in season during the season of your wedding. Certain flowers that are available in spring may not be available in summer, fall or winter in your area. Look in wedding magazines and online for ideas that might work well for your wedding. Designing and creating your own bridal bouquets can be quite a challenge. Not only do you have to choose the right color, style and size of flowers, you have to assemble them into bouquets for yourself and all of your bridesmaids. Be realistic about and overestimate the time that you will be putting aside to create your bouquets. While it definitely isn't for everyone, creating your own bouquets can be a great way to show off your creativity. Below is a video that explains how to create a hand tied bridal bouqet. Find more "how-to" videos at expert village.